The cairns have been well researched in recent years with excavation by Richard Bradley (The Good Stones) and they have been dated to the Early Bronze age, about 4000 years before present. The cairns at Clava itself have been subject to a variety of excavations since the nineteenth century. By the latest on the 1990s there was very little left of the original surface in the chambers however there was some evidence of cremated bone and flints beyond the chambers. Where other Clava type cairns have been investigated evidence of adze marks suggest the cairns were built on carefully prepared adze ground showing the ground had been cleared and levelled. Unusually for burial cairns they are often situated on better ground which could, and may previously have been used for agriculture. The majority of the following sites are on private ground and as such NOSAS relies on people to behave as they would if they were visiting any private property. It is recommended that you check with the owner that they do not mind if you visit the sites. The majority of owners will be very generous in allowing visitors access but there are occasions when it is inappropriate to enter fields containing animals or crops. I also would suggest you check the HER references prior to visiting any of the sites as several are only of real interest to a devoted cairn visitor. Many of the sites below are scheduled monuments. Unfortunately in an area of good agricultural ground many of the remaining cairns have been either removed almost completely or reduced almost to nothing. 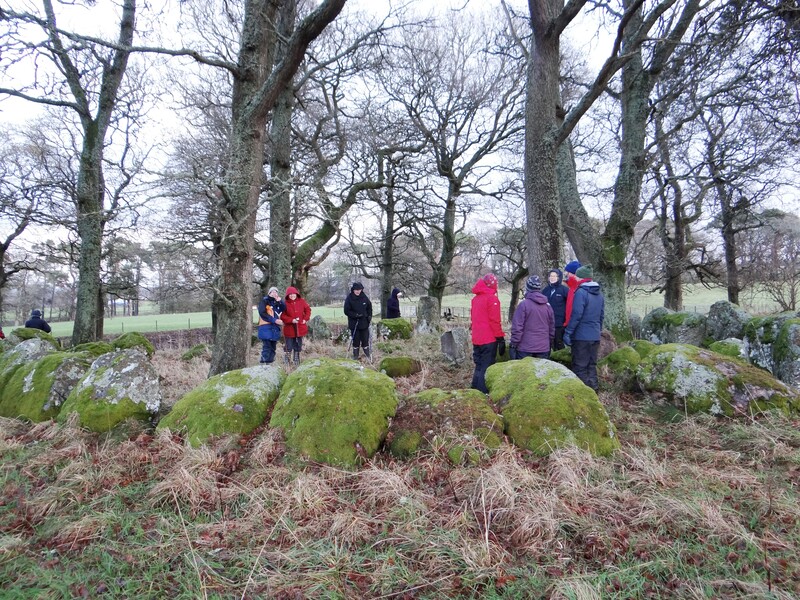 In the immediate area of Clava eight more cairns have been identified. Beyond the enclosed area at Balnuaran of Clava it is possible to see the sites of 4 other cairns in the fields to the east on either side of the road. These are either substantially removed apart from a single standing stone (MHG54934) and a low mound (MHG54933) to scattered mounds of stone under gorse bushes (MHG2961 and MHG3011). These can be adequately viewed from the car park at Clava as very little remains of the cairns. To the south south west and a short walk along the road from the car park there is another site in the care of Historic Scotland where there are 2 more cairns which have been substantially disturbed and provided the stone for a much later chapel and burial ground dedicated to St Dorothy or St Brigit (MHG31425). Beyond the fence on private ground is a mound about 20m in diameter which has been scheduled as the remains of yet another a Clava cairn. The last of the immediate group is further to the SSW approached through the next farm and again is on private ground. Culdoich (MHG2957) 18m in diameter and has an almost complete inner and outer kerb and a single standing stone c.3m high with 2 cup marks. Culdoich South (MHG28930) is the most recently recognized Clava cairn. 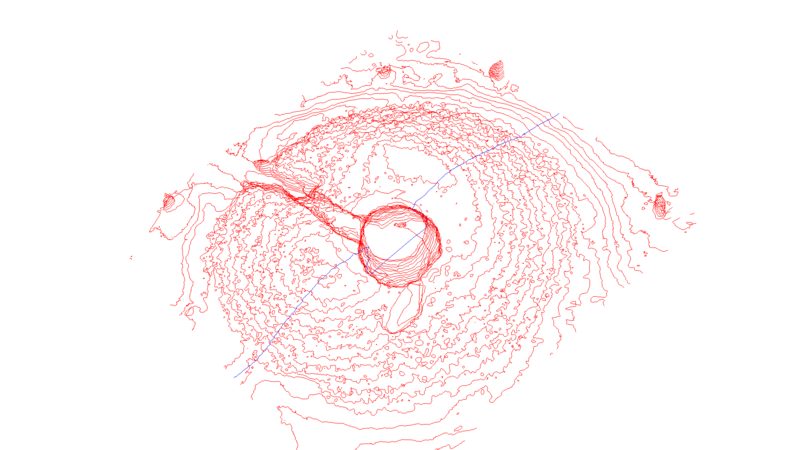 It has an outer kerb around a low mound and defined passage; it is about 11m in diameter with at least one fallen stone of the stone circle. Private ground under railway and up the hill from Culdoich. From this site it is possible to see two more cairns across the valley. Culnacaigh (MHG2974) has a partial outer kerb and is 19m in diameter and a single standing stone 2m high and Leanach (MHG2973) cairn only has only 3 standing stones remaining. Both on private ground. Beyond Nairn and Auldearn at Moyness is a Clava cairn presented to the public (MHG7208). The outer kerb survives well with the inner kerb confused by excavation trenches. There are several stones of the stone circle surviving in the walls on both sides of the road and at least one has been blasted in two in the past, there are very visible holes drilled into the remains. Just visible from the road through the gates of the private house on the way to Moyness from Auldearn are 3 standing stones that were probably part of another Clava cairn (MHG7055) Easter Clune (MHG7211) has only the outer kerb 22 m dia and a raised inner platform suggesting a Clava cairn with no stone circle. Private ground. Arr Wood cairn (MHG14357) may be a Clava type, it is a kerbed cairn but there is no sign of stone circle but pleasant walk! The A96 on the way into Inverness passes between a Clava cairn and a possible chambered cairn, both are very visible from the road and the one on the south side of the road, Cullearnie (MHG2948), is the better preserved one but has no stone circle. The one on the north side of the road, Allanfearn (MHG3022), is possibly not a Clava type but may be a Neolithic chambered cairn. However yet another word of caution, parking is very difficult on the roadside. 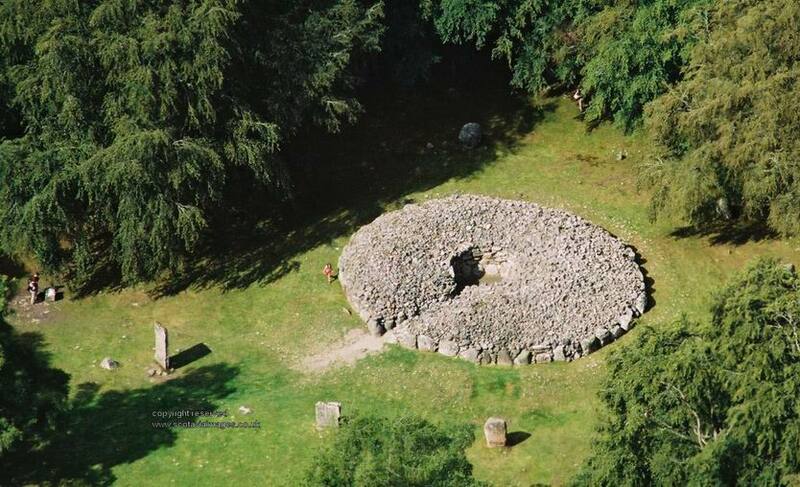 Druid Temple (MHG3790) is one of the best surviving Clava cairns close to Inverness although the HER description suggests it is denuded there is still an almost complete ring of outer kerb stones c.13.5m in diameter with some inner kerb stones. A huge standing stone just beyond the possible entrance with 4 other standing stones and several fallen stones form the stone circle. Private ground. Druid Temple Farm cairn, on a NOSAS field trip in January 2015. To the south of Inverness and east of Loch Ness, Mains of Gask (MHG3476) at c.27m in diameter is thought to be the largest Clava cairn. It has an almost complete outer kerb and a small number of inner kerb stones. There are 3 standing stones of the stone circle in place, the largest is c.3m high. A further 5 stones have fallen. There are at least 3 stones with cup marks. Private ground. (MHG3875) West Town has been disturbed and used for piling field stone on in the past but the inner kerb seems to be fairly intact, the cairn is c.25m diameter. Private ground. Dores Clava cairn lies in a clearance in woodland (MHG3551). 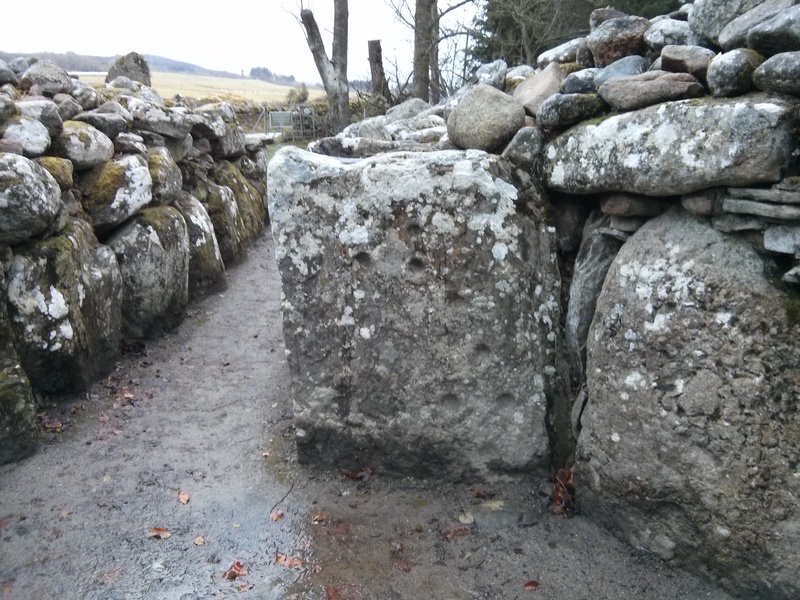 The inner and outer kerbs are mainly in place and the cairn is c.9m in diameter. The passage is south facing. The stone circle has 8 stones, some fallen. North west of Loch Ness, (MHG2733) Culburnie is a very well preserved cairn c.14m in diameter with the complete outer ring of kerbstones retaining the inner fill of stones to a height of 1.5m. The inner kerb is also complete and it is not clear where the entrance is, if there was one. 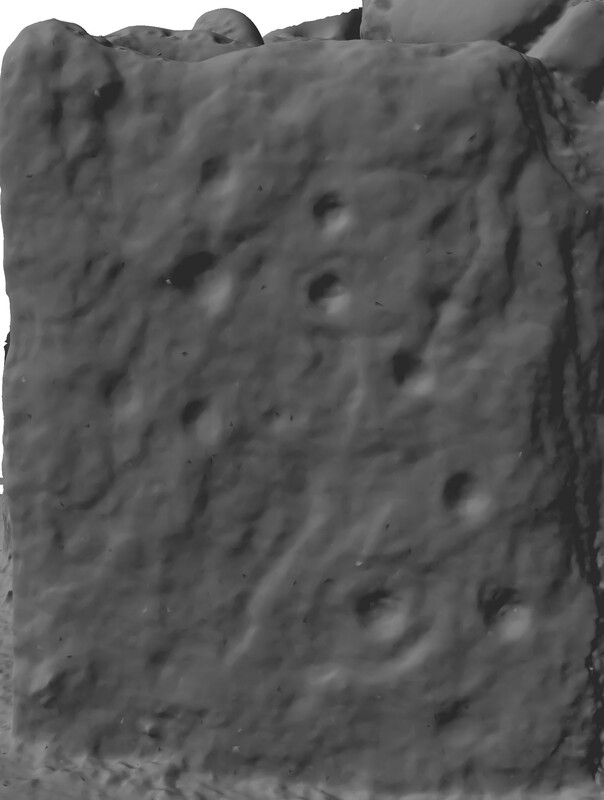 The cairn has been incorporated into a field wall in the past. The stone circle is almost complete with 8 stones and one missing. The largest stone is c.2m high and there are cupmarks on it and 2 others with cup marks on 3 of the outer kerb stones. Private ground, but can be seen from the narrow road beside the croft. 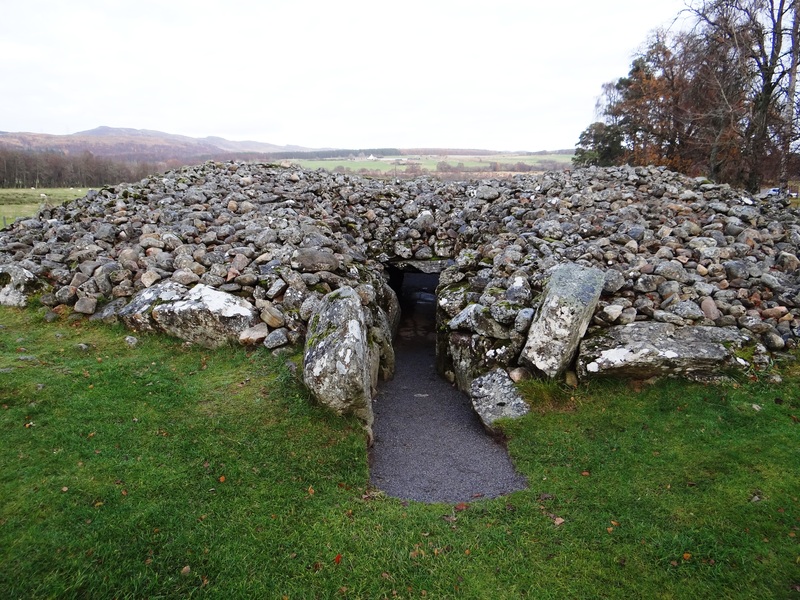 Corrimony (MHG2626), a Clava cairn west of Drumnadrochit is cared for by Historic Scotland and is open to the public. 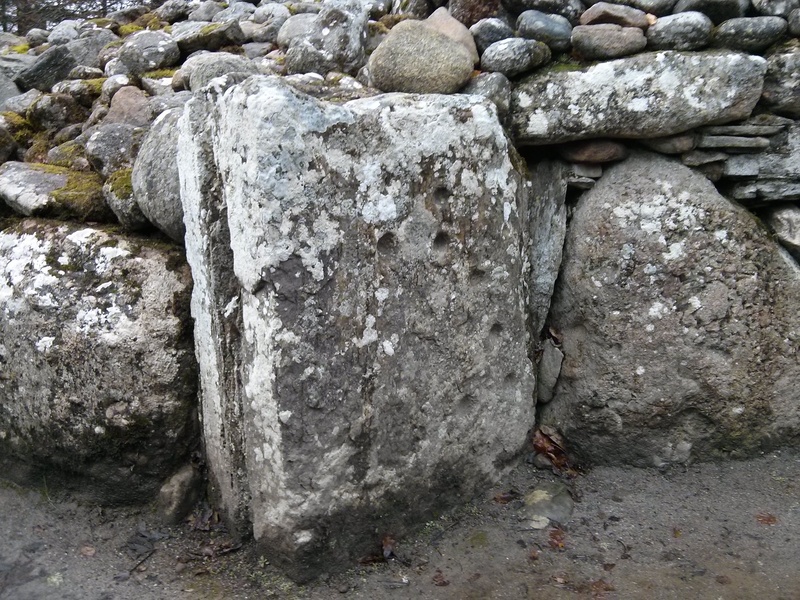 It is c.18m in diameter with the inner and outer kerbs intact and a degree of corbelling over the chamber with the possible cap stone lying on the cairn stones. The entrance is also complete. The stone circle is complete with 11 stones, 4 are replacements and 2 have been reset. The largest stone is c.3m high. The chamber is flagged and a crouched inhumation was found below the flags when the site was excavated in 1952 by Piggot. There are cupmarks on one of the standing stones and on the possible cap stone. Another much denuded Clava passage cairn, Carn Daley (MHG2683), can be found several miles to east. Corrimony Cairn taken using camera on 5 metre pole and processed with photogrammetry (Alan Thompson). 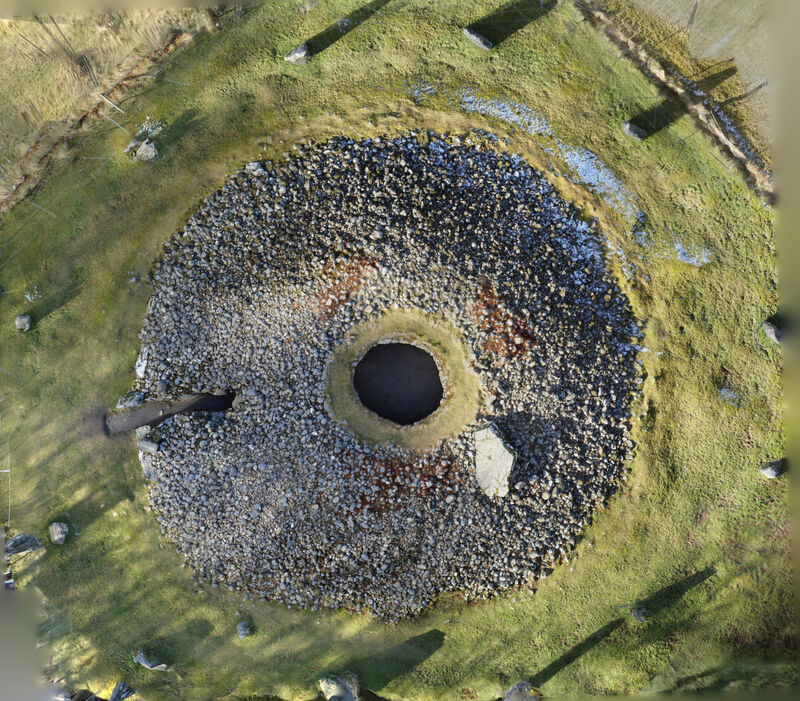 Corrimony Cairn processed with photogrammetry – alternative view showing entrance passage (Alan Thompson). There are 4 cairns south of Inverness in the Badenoch and Strathspey area. (MHG4428) Delfour remains as the inner and outer kerb stones c.18m in diameter with 2 standing stones of the circle. The upright standing stone is c3m high, the second stone has fallen. Private ground. There are 2 cairns at Avielochan (MHG4650) is c.13m in diameter with the kerb and passage visible. Nearby a second cairn is smaller and ‘much robbed’ (MHG14344). Loch nan Carraigean (MHG4647) c. 18m in diameter this is one of the best preserved Clava cairns not in Historic Scotland’s care. It has an apparently complete outer kerb with a clearly defined inner kerb. The grading of the outer kerb stones is clearly visible. There are 2 fallen standing stones and 4 hollows which seem to indicate where other stones would have stood. This cairn is easily accessed from the nearby footpath and sadly seems to be a magnet for people to have a little dig, causing considerable damage to the cairn. (This site is scheduled so they are breaking the law!) There is a small nearby mound of stones which may be a cairn or a clearance cairn. There are thought to be at least 50 Clava cairns so this is a very small sample. 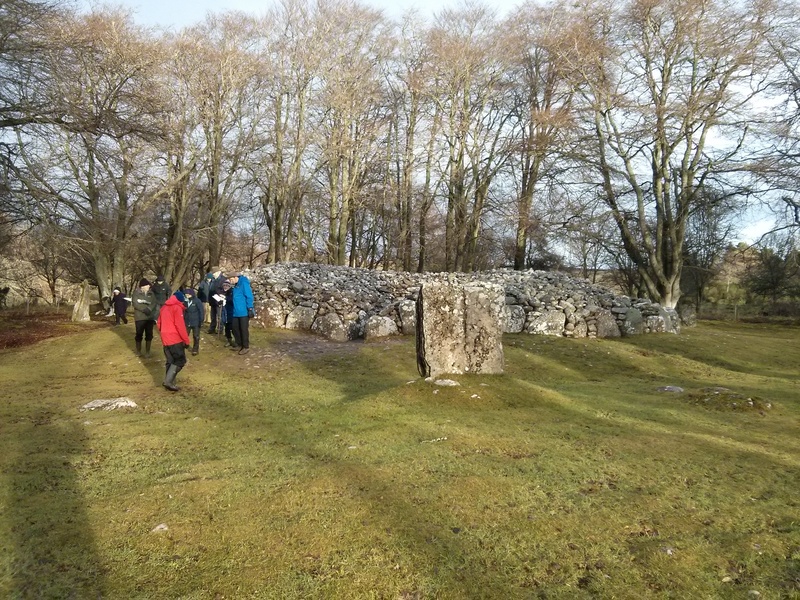 Further pictures of Clava Type Cairns.